It is a universal indicator assembly for Tata commercial vehicles. It contains 12 SMD LED. Comes with a unbreakable glass, needs no replacement. 10 times more brighter light. 10 times more life. Common for left and right side. Cheaper than an ordinary bulb assembly. Our product is manufactured with good quality raw materials. 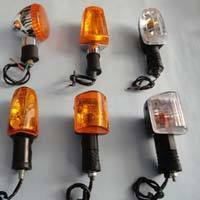 Turn Indicator Lights also known as Directional Indicators (formally) or Blinkers, Flashers (informally), are an essential part all automobiles whether a bike or a car. … Bike Turning Signals are used to indicate the intent of left turn or right turn to other users of the road. We offer a wide range of Automotive Back Lights Assembly. These back lights with halogen bulbs assure better visibility thus making driving at night safer. These back light assembly are easy to install and are properly packed in corrugated box and safely delivered. These lights are available with durable and clear glass lens.